An 11-year-old boy in Michigan had an encounter last week with one of nature's most awe-inspiring sights - an albino deer, alive and free in the wild. Only about one in 20,000 deer are born with albinism, and far fewer survive to maturity like this one had. But the boy was on no nature walk; he was on a hunting trip with his father, and the rare deer wouldn't survive the day. With the encouragement of his father, Mick Dingman, the sixth-grader steadied his crossbow and fired a fatal shot through the deer's lungs, besmirching that snow-white coat with the spill and splatter of blood. The rare animal had been seen by folks around town leading up to that moment, but now this deer was the Dingmans' alone. Dingman tells the Livingston Daily that he plans to commemorate the killing by getting the 12-pointed buck mounted by a taxidermist: "It's too rare and too pretty not to spend the extra money and have the whole thing done." "[My son] kind of feels like a rock star right now," says Dingman, adding that the youth's supposed accomplishment has caught the attention of hunting magazines, who are interested in sharing the story. But not everyone is so excited. 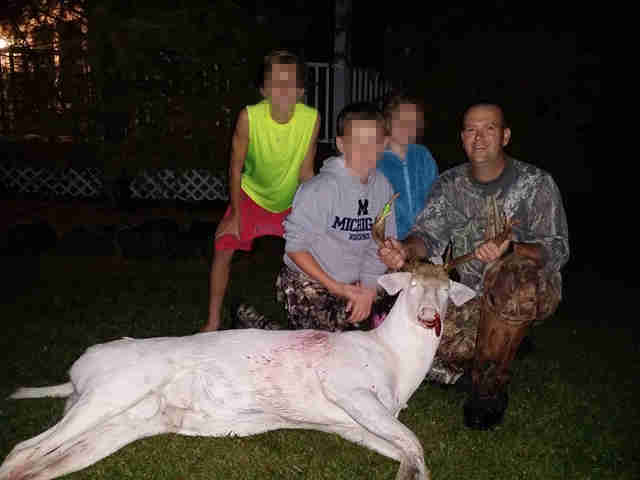 Amy Sprecher, in neighboring Wisconsin, runs a white deer protection group composed of hunters and non-hunters who are opposed to killing albinos - and she says stories like this are "maddening." "It's just wrong. I don't understand why'd you'd want to take that animal away from everybody," Sprecher told The Dodo. "There are people who want to hunt white deer for bragging rights, but that's not what hunting is about. Hunters that would never shoot a white deer don't understand these people either." And Sprecher is not alone in her outrage. Not long after the Livingston Daily posted this photo and story online, readers began expressing anger. "Wouldn't you much rather observe something so rare again year after year than just stare at this giant full mounted carcass for the rest of your life?" writes Christina Brown. "This deer was in our backyard in the spring and my wife took a picture. All of the people near us wanted to only shoot pictures, not the deer. We aren't anti hunting but instead wanted this rare deer to be able to spread his genes so his legacy lives on after he died of a natural cause," writes Tim Reinert. 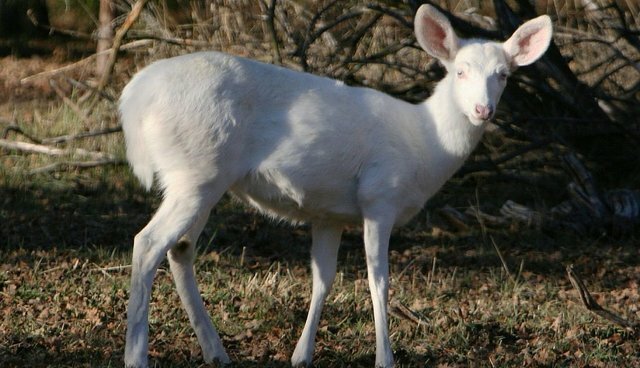 Given the rarity of albino deer, four states, Illinois, Iowa, Tennessee and Wisconsin, have made it illegal to kill them. Critics have argued that laws protecting white deer are based more on emotion than science - arguing that albinism is a genetic disorder, not something to be cherished - but emotions surrounding white deer is certainly nothing new. According to Native American tradition, white deer, like the one killed by Mick Dingman's son, are one of the most sacred creatures on the planet. "Albino animals are looked at as a spirit animal, which you are suppose to learn from rather than shoot and kill," Jonnie J. Sam, from Michigan's Ottawa Indian tribe, told The Dodo. "I'd be more inclined to see if the animal has something to teach me, but sadly not everybody looks at it that way."